The model 3200 series device is device is a new Mass Flow controller that has results in various fields such as semiconductors, LCDs, combustion, analysis, and biotechnology and designed as the successor of the 3910 series. 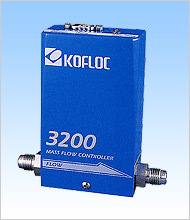 It is a high-performance model that is suitable for a new Kofloc standard. The *LP (low differential pressure) specifications differ with gases and flow rates.